Howdy, everyone! LionWing president Bradly Halestorm here, and today we bring to you a look at one of Sainome Colosseum R's ten playable characters, the One-Eyed Bowman/Crimson Sniper. We'll be taking an in-depth look at the character's lore and gameplay while exploring both his Normal Form and Awakened Form. So without any further ado, let's get to it! The bowman's story is one of intrigue. Due to his somewhat cold, uncompromising personality, there's a subtle air of mystery about him. It's also seemingly implied that when he hunts, he does so alone, further adding to his enigmatic temperament. But, what's most interesting is the nuance of that which is not explicitly told to the reader. For starters, why does the bowman track these creatures? He seems to have dedicated his life to hunting them but there's no obvious reason as to why. Strangely enough, there's no mention of where these Wild come from nor why they're so aggressive. Moreover, just who invited this archer-of-few-words to the tournament? And to that end, what would a hunter such as the bowman have to gain by entering this kind of martial arts tournament? He doesn't seem like the type to want gold or fame—and why would he, given his craft? Lastly, how does the bowman's Awakened Form, the Crimson Sniper, fit into all of this? As we saw with the priestess and swordsman, there was something dark hidden beneath the surface of both of those characters. While it's possible the bowman is hiding something equally as disturbing, such a plot-twist is not hinted at nearly as strongly as it was with those previous two fighters. Needless to say, the bowman's story is a fascinating one because it raises more questions than answers them. Now let's discuss the character's playstyle by starting with his Normal Form abilities first. The first ability of the One-Eyed Bowman is called “Master Archer” and states that the “Longbow” Sainome Card deals +2 damage, which also applies when Longbow is used as an Instant Play action. This skill is pretty conditional as it can only be utilized when the player holds Longbow in their hand. Of course, if you have Longbow, then Master Archer can turn Longbow, which does 2 damage (+1 damage if the Longbow roll is an even result; -1 if it’s odd), into potentially an attack that does up to 5 damage. 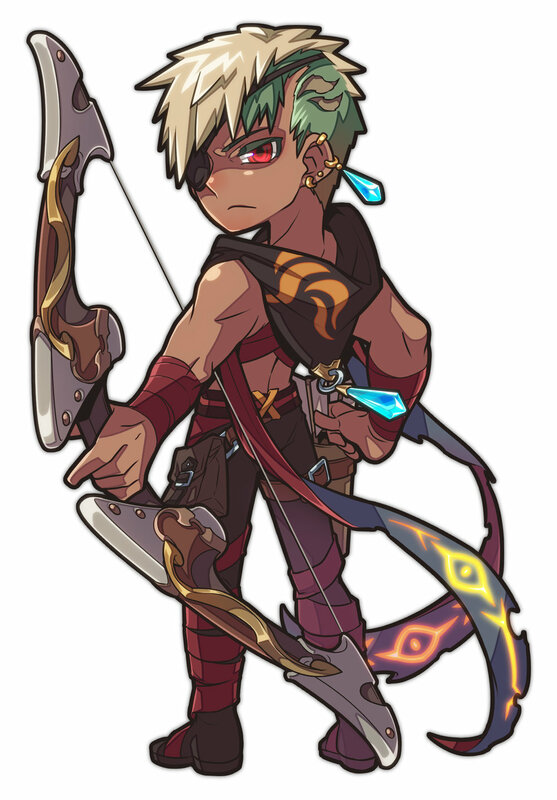 The second One-Eyed Bowman ability, “A Marksman’s Devotion,” is the skill that allows him to awaken. Like the Pure-Hearted Swordsman, the bowman has to have taken some punishment before being able to awaken into the Crimson Sniper. A Marksman’s Devotion states that the character awakens once he hits 5 HP or lower. This means that players will spend a good amount of time as the character’s Normal Form. Unlike the Pure-Hearted Swordsman, who has a really useful and effective ability in “Proficiency” as his only attack-based Normal Form ability, the bowman’s Master Archer ability is not as general a skill. Because it can only be activated when holding one particular card, players have to devise a strategy around getting Longbow into their hand or merely hoping that they take a beating to get into the Crimson Sniper Form quickly. Once "awakened", the One-Eyed Bowman, now the Crimson Sniper, becomes quite a bit more combat effective. He only has two abilities in this Form, but both are powerful. The first ability, “Snipe,” states that, before following the die during an Attack action, players may declare a value of 2-5 for the two star equipment slots along the right and left sides of the card. This is powerful because of the fact that being able to make both slots the same value means that, if that value is rolled, both slots are activated, allowing for a double attack. But where the true strength of this ability lies is in making the star equipment slot values either 2 or 5, due to the Crimson Sniper’s top and bottom equipment slots being 2 and 5 respectively. If one were to make the star equipment slots 2 or 5, and one of those values was rolled, the Sniper could pull off a triple attack. This could, and very likely would, be deadly. The Crimson Sniper’s last ability, “Perfect Aim," is a boosted version of Master Archer in that, for both the "Longbow" and "Crossbow" Sainome Cards, +4 damage is added to the attack. As mentioned above, Longbow can already do up to 3 damage, so adding +4 to that means Perfect Aim can make Longbow almost a one-shot-kill card. Furthermore, when using Perfect Aim in conjunction with Longbow specifically, the player is not required to discard Longbow after it’s been played. So that means in two turns’ time, the Crimson Sniper could theoretically do 14 damage, more than enough to defeat his opponent. Wowzers. The One-Eyed Bowman/Crimson Sniper is all about burst damage. But to achieve such power, the player must have the right cards in their hand and/or equipped. This makes the Bowman/Sniper a fairly luck-dependent card. So, players could end up doing big damage and ending the match quickly, or struggle to do substantive damage if they aren’t regularly pulling Longbow or Crossbow from the Common Deck. What makes him all the more challenging to play is his high threshold for awakening. With having to be at 5 HP or below to awaken—with a significantly conditional ability in Master Archer as his primary means of dealing damage through his abilities—it can be hard to hold one’s ground as the One-Eyed Bowman. By the time that you do awaken, you better hope to have Longbow or Crossbow in your hand, as the game could be over quickly otherwise. The best strategy in fighting against this character is sustained, small damage until he’s near 5 HP and then unleashing a big attack to knock him out before he gets a chance to pull off game-ending plays as the Crimson Sniper. And that'll wrap up this entry in our Character Spotlight series! Check back next Thursday when we drop our next mega-sized blog chronicling the lore and gameplay of our next character! Like always, if you have any questions or comments for us about the characters as we go along, don't hesitate to hit us up on Twitter, Instagram, Facebook, or in the comments section below.